Security services have prevented 13 potential terror attacks since June 2013, the UK's most senior counter-terrorism police officer has revealed. Assistant commissioner Mark Rowley also said there were 500 live counter-terror investigations at any time. He disclosed the figures as he launched an appeal, Action Counters Terrorism, for the public to report suspicions. Information from the public has helped police in a third of the most high-risk investigations, figures show. It has also contributed to stopping some of the 13 attacks - a figure one higher than the last update, given in October. Police have not detailed what the 13 incidents since 2013 were, but a number of them have already been through the courts. Describing the public's contribution as "extraordinary", Mr Rowley said: "Some of that information is a change in someone's behaviour, some of that's about suspicious activity. "Sometimes that public information has actually started an investigation. "Other times it's part way through and it corroborates some things or adds to things we already know." He told BBC Radio 4's Today programme that despite the public already playing a big part, some people said they were "slightly reluctant" to come forward and not sure of the help that police needed. Mr Rowley urged the public to "trust your instinct" and "don't be cautious" when thinking of reporting anything of concern. The new police appeal includes a podcast of untold stories of how terrorist attacks were foiled, featuring accounts from detectives, bomb disposal and surveillance officers. One example involved a visiting lecturer, who taught a self-radicalised student and raised concerns about his behaviour. "He was asking me which sort of different bacteria could be used to kill people. It was a fairly long conversation but there were quite specific questions he was asking me and I really evaded giving the answers. "Almost immediately I thought 'oh this is just a bit of an odd thing to ask someone'. It was at that point I thought it was prudent to report what I heard to the management of the college." Other reports from members of the public led to the 19-year-old's arrest. To hear the full podcast click here. Andrew Ibrahim was jailed for 10 years in 2009 after planning an attack on a Bristol shopping centre. Investigators have been making arrests at a rate of close to one a day since 2014. The official threat level for international terrorism in the UK has stood at severe - meaning an attack is "highly likely" - for more than two years. Much of the threat is posed by so-called Islamic State, but senior detectives said al-Qaeda remained a danger, as did far-right terrorism. Mr Rowley said police faced a range of threats and challenges, including encrypted communication methods, propaganda and various possible attack methods. "Now we worry about everything from fairly simple attacks with knives or using vehicles, all the way through to the more complex firearms attacks," he said. "All of that means that our job remains difficult." In the year to March, the anti-terrorist hotline received more than twice the number of calls - 22,000 - compared with the previous 12 months. 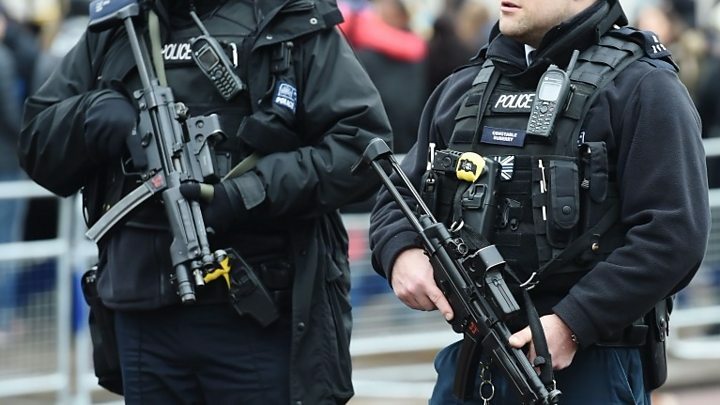 A survey of 2,198 adults across Britain found that most respondents believed it was important for communities to work with police to defeat terrorism. However, a quarter of respondents to the police survey said they might not report their suspicions because of fears over wasting police time and almost two in five were unsure about what suspicious behaviour might look like. Mr Rowley said: "If it turns out to be a call where you made it with good intent but actually there was no problem at the end of it, that's fine. "We'd rather have many calls like that, rather than miss out on the critical one that helps us stop an attack." Audio Why is MI6 so open about the threat of terrorism?